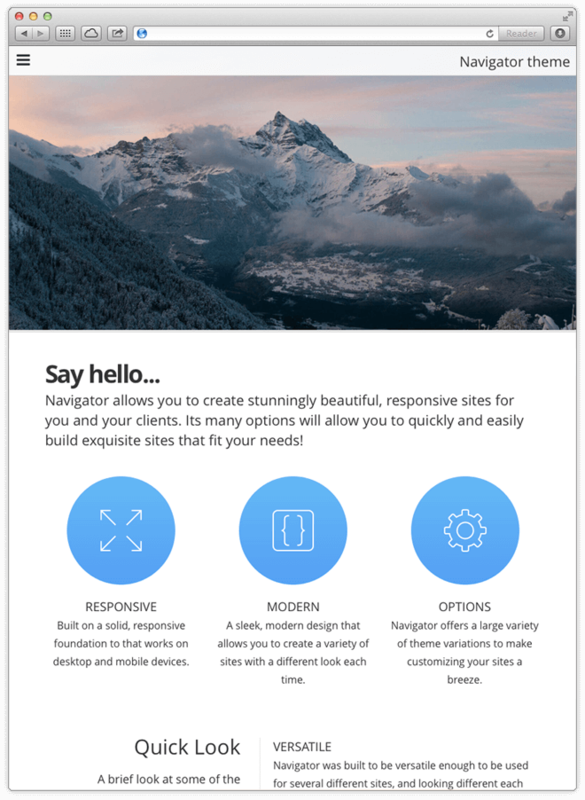 The Navigator theme is designed to allow you a great deal of flexibility in designing sites for both yourself and your clients. It's built around a beautiful navigation system and a responsive foundation, allowing you to focus on the most important part -- your content. This theme was designed with reusability in mind. Its minimalist, yet stylish layout along with its professional animations and extensive ExtraContent area allow you to build site after site without them all looking the same. These aren’t Navigator’s only features though. Not by a long shot. There is a lot more to see and learn about this beautiful new theme. Be sure to check out the Navigator theme’s product page to read up on all of its features, as well as to check out our overview and tutorial videos, along with our live preview site. If you need some great stock imagery to use for the banner area in the Navigator theme, be sure to check out our stock images section of the site. We’ve got a lot of great abstract stock art that works wonderfully for these purposes, and are always adding more.